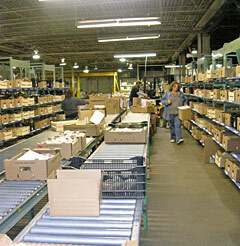 Central Packaging and Fulfillment, Inc.
Central Packaging & Fulfillment, Inc. has been packaging, warehousing, assembling and distributing products for over 10 years. We've recently expanded our operations to Benton Harbor, MI, where our centrally located facility services 73% of the US population within 3 days ground shipping. Our staff is continually dedicated to excellent quality standards, attention to detail and superior customer service. We will work with you on any special requirements needed by your company.